Originally published under the title "Violent Protests in Indonesia Blow an Ill Will for Religious Tolerance." Hardline Islamists assemble around a poster reading "Ahok should be jailed" at a protest in Jakarta on November 4. Violence between protesters and police in Jakarta broke out Friday night, November 4, 2016, when an estimated 200,000 Muslims emerged from Friday prayers in mosques to rally outside the Indonesian president's palace. Clashes with police led to tear gas being used on demonstrators, and Indonesia's president, Joko Widodo, had to postpone his planned visit to Australia to deal with the crisis. The crowd was calling for the arrest of Basuki Tjahaja Purnama, known as Ahok, the ethnic Chinese Christian governor of Jakarta, which is Indonesia's capital and the largest city in the world's fourth most populous nation. A video had gone viral showing Ahok referring in a speech to chapter 5, verse 51 of the Qur'an. He warned his listeners not to give credence to those who might try to deceive them with this verse or others like it. Ahok has faced criticism before from hardline Muslims, who objected when he stood as deputy governor of Jakarta in 2012. Yet Ahok is very popular, and seems set to win the next gubernatorial election in February 2017. He previously took office as governor in 2014 after Joko Widodo resigned his position as Jarkarta mayor to take up the presidency of the nation. The word translated here as allies (Arabic) awliya, is ambiguous. It can mean "allies," but also "patrons" or "guardians." The rejection of dependence upon disbelievers is emphasized repeatedly in the Qur'an (e.g. in verses 3:28 and 4:141, 144). In Indonesian translations of the verse 5:51 is rendered "do not take Jews and Christians as your leaders (pemimpin-pemimpinmu)." Allah forbids his believing servants from having Jews and Christians as allies or patrons, because they are the enemies of Islam and its people, may Allah curse them. is a disbeliever who deserves to be fought against (i.e. to be killed), until he reverts to Allah's and His Messenger's decisions, so that no law, minor or major, is referred to except by His Law. 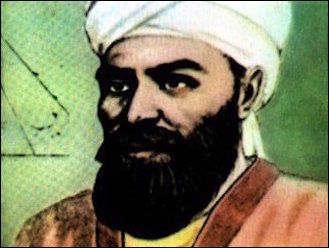 Ibn Kathir is insisting that the only valid form of legislation is the Islamic sharia, that only Muslims can rule, and any Muslim who looks to non-Muslims for political or legal direction is an infidel. According to verse 5:51, such a person is already "one of them": in other words, they have to be considered an infidel too, and have apostatized from Islam, for which the penalty is death. The admonition to Muslims not to take non-Muslims, and especially Christians or Jews, as allies or leaders is orthodox, mainstream Islamic teaching. Some interpret [verse 5:51] as prohibiting Muslims from living under the leadership of a non-Muslim. Others say the scripture should be understood in its context — a time of war — and not interpreted literally. It may be true that a few contemporary moderate voices may say this verse should not be taken literally, but this is certainly not the mainstream view of centuries of Islamic jurisprudence. The Muslim aversion to non-Muslim political leadership has many outworkings around the world. In Egypt, Christians make up around 10% of the population, but less than 1.5% of the parliament is Christian. For decades there had been no Christian governors for any of Egypt's 27 governorates, until Mubarak appointed Major General Emad Mikhail as governor over Qena. 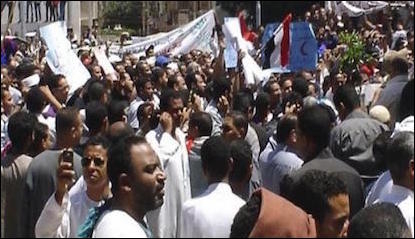 Tens of thousands of Egyptians responded to a call by Islamist groups for a rally in Qena against Christian governor Emad Mikhail in April 2011. However, massive protests broke out after imams preached sermons in Qena mosques teaching that God does not permit Christians to have authority over Muslims. Demonstrators marched the streets crying, "A Muslim governor in a Muslim country" and "There is no god but Allah and Christians are the enemies of Allah." The protests led to the governor's appointment being temporarily suspended in order to reestablish the order. Ahok's position is difficult. Since his opponents were unable to discredit him politically for being a Christian, they are now upping the ante by accusing him of blasphemy instead, demanding that the state launch legal proceedings against him. In Ahok's speech, he had brushed aside those who were citing 5:51 against him, saying they were telling lies. In fact, he made no comment on the Qur'an itself, apart from implying that a particular interpretation was false. His offense was to criticize the misuse of the text by others for political purposes. Yet this gave enough leeway for a vast crowd to be inflamed against him. Whoever sees an evil, let him change it with his hand; and if he is not able to do so, then with his tongue; and if he is not able to do so, then with his heart — and that is the weakest of faith. This is interpreted by many to mean that a Muslim must use the highest level of force available to remove something evil. The protesters in Jakarta were exercising their religious duty by speaking out against a Christian being in political authority over a 95% Muslim city, using his alleged blasphemy as a trigger point. Some went further than just words, threatening action "with the hand": former terrorist Nasir Abas, turned police consultant, carried a sign saying "Punish Ahok or our bullets will." 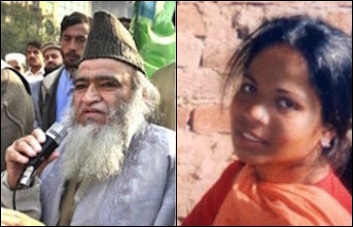 Pakistani Imam Maulana Yusuf Qureshi (left) offered $6,000 to anyone who would murder Asia Bibi (right) for alleged blasphemy in 2010. The phenomenon of Muslims taking political or legal processes into their own hands is widespread. An example was the offer made by Pakistani Imam Maulana Yusuf Qureshi of a bounty of $6,000 to anyone who would murder Asia Bibi, a young Christian woman on death row for a trumped-up blasphemy offense. Recently Muslim activists have been conducting mass public protests across Pakistan calling for Bibi to be lynched. "It will be a war if accursed Asia escapes," said Mukhtar, one of the protesters in Lahore. Another example comes from the UK in 2009, when Geert Wilders was invited to a private meeting at the House of Lords in London. In response Lord Nazir Ahmed, a Muslim peer, threatened to personally mobilize 10,000 Muslim protesters to physically prevent Wilders from entering the House. Muslims taking the law into their own hands to act against non-Muslims who rise to high political office is not a new phenomenon. Egypt's only Christian Prime Minister was Boutros Ghali, who served from 1908. He was the grandfather of the former UN Secretary General, Boutros Boutros-Ghali. He was assassinated in 1910 by a European-educated Egyptian Muslim, Ibrahim Nassif Boutros Ghali -Wardani. Do not consider it a breach of faith to kill them — the breach would be to let them carry on. They have violated our covenant with them, so how can you be held guilty against the violators? How can they have any pact when we are obscure and they are prominent. Indonesia is often held up as a model of a moderate Muslim-majority nation. Its constitution is not Islamic and many Indonesian Muslims espouse moderate views. However the global Islamist movement has nevertheless made strong inroads in this the most populous Muslim nation. Undoubtedly it will be a landmark test for Indonesia's tolerance whether Ahok is permitted to continue in office. Those Muslims who are raising both their voices and their hands to protest against him will not be easily silenced. This outbreak of intolerance bodes ill for Indonesia's future. Governor Ahok is being supported by significant Muslim leaders. 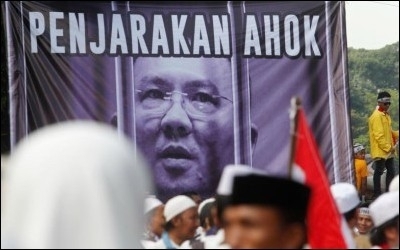 GP Ansor, the former chairman of the largest Indonesian Youth organization called the complaints a "hoax," and politician Nusron Wahid stated that Ahok had said nothing to insult Islam. For his part, Governor Ahok has apologized to Muslims, saying, "To Muslims who felt insulted, I apologize. I had no intention to insult Islam." He stated that "Religion is a very personal matter and should not be mixed up with public discourse." However his Muslim opponents clearly hold a different view about the place of Islam in public life! Ahok is being questioned this week by the police, pending a possible charge of blasphemy. The thought that an Indonesian court might find Ahok guilty of such a charge is troubling. To do so would require proof that Ahok intended to incite hatred against Muslims, defame Islam or incite apostasy. The prosecution might argue that in pooh-poohing the legitimate and well-established Islamic prohibition against non-Muslims taking authority over Muslims, he was denigrating the religion. Even if no charges are laid, Ahok will certainly come under very great political pressure to withdraw his candidacy. In Indonesia today it is apparently unacceptable to some Muslims that a prominent Christian might express an opinion about what the Qur'an says. Yet the same Muslims claim the right to stridently disallow this Christian candidacy for political office, based on the very same Quranic passage. Does Islamic sharia permit non-Muslims to live alongside Muslims as equals? This is supremacist reasoning, which incites hatred while denying the object of hatred any voice in the matter. If this intolerance is given credence by the Indonesian police and courts, it bodes very ill indeed for the nation's future. Yet the greater concern is a question for us all: Does the Islamic sharia permit non-Muslims to live alongside Muslims as equals in one world? This is a crucial question, not just for Indonesia, but for Europe, for America, indeed for every nation with more than a tiny minority of Muslim citizens. According to the hundreds of thousands protesting in the streets of Jakarta this week, the answer to this question is a resolute and loud "No!"